Can you guide me how to make a donation? I am interested in this Mod. How would I make the donation to get this full version? Thanks for this awesome mod. Hi Warren, thanks! The donate button is at the top right of the page above the search/go area. hehe, np. Just put the zip file in scp/ and open it there. Then just make sure everything has the correct permissions for the web server use (usually apache, httpd, or www-data). Thanks again for the Great MOD Scottro! Nothing just yet, initial release is just compatibility with osTicket 1.7. More is planned though. Nice website. By the way, saw you 160 production osTicket theme and I am interested. Send me an email (as I couldn’t find any contact form on your blog). Do you have more osTicket templates? The 120 Production theme doesn’t yet work with osTicket 1.7 but I’m going to be working on getting a new version that will be soon. Presently it’s my only template but I’m thinking about making more. I am trying to find out if your 120 Productions SCP skin is suitable for 1.7 use can you confirm? The 120 Production theme doesn’t yet work with osTicket 1.7 but I’m going to be working on getting a new version that will be soon. i have just donated for the script – please advise how to download it. I installed and made the changes following the above steps. But when I try to login in admin section, I am getting nothing only blank page. Can you please provide me step by steps how to go about? Any reply to my above query? Make sure you have the right permissions on the reports_admin.php file and also check your error log to see if there is anything useful in there. Hello Steve, Thank you very much for the great,great job u did for us. Now, me and my company are enjoying the result of your job. If I go into report criteria, choose report type and select ‘tickets by help topic’, and submit, there is a field called ‘null’, which maybe is a default for tickets with no help topic. I want to modify it and call it for example ‘others’. Please help. Or if any other can intervene, i will be more than happy. Is there a report that groups on who the ticket is from? To show that this person submitted x tickets and that person submitted y tickets, etc. good day, please I request your help, I have installed locally ostickets I mean at 127.0.0.1, and it works perfect, the problem is that when you include the reports module, to change or replace the file header.inc . php with the correct module code, the system will not charge more, this returns a 500 error. if i use it on a web server if it works perfect, but locally not work I do not know what could be? If you are getting a 500 error message there should be something helpful in your error log. See what that says and if you need any help let me know what the error is and I’ll do what I can to help. Well, I thought I followed everything correctly. But after logging into scp and navigating to reports.php I see messages like this: Can’t open reports_csv/Report_1374457836.csv. Also get that when trying to run a report. Also for reports_admin.php I get Unable to load the webpage because the server sent no data. Error code: ERR_EMPTY_RESPONSE. I figure I probably need to do something with permissions or something, but I am not sure what or where to do it. Yep, first thing to check would be the permissions. Also, make sure everything is dumped into the scp/ folder. If that all appears correct check your web servers error log and see if there is anything helpful in there. Feel free to email any errors in the log to me and I can work with you to get it all resolved. I did all the steps that are shown above, but whenever I try to click on the reports link in the scp page it comes back with a blank page. Is there something that is missing such as reports php? do you include that when you make the donation? Yes, if you haven’t donated there are dozens of files you would be missing. We are very interested with this but do you have any demo available? I am not sure if this mod has the reporting feature I am looking for. I don’t just yet, I hope to be setting one up tomorrow night though! Hi, I was watching the mod I think, is very good congratulations. client, date, ticket number, time spent, ticket status? After, many issues , your reports Mod Works well. I’ve Internationalize it with gettext, in french. Is it possible to add a PDF export button in next release near csv export. It could be very interresting. I try to work on it , with html2pdf but it does’nt work properly. we receiving Valid CSRF Token Required error. is there anyway you could help us? Where can I make the donation of 10$ in order to get the latest version of the software? Very impress with your reports. Were can I send my donation to have the report files? do you use Paypal? I tried emailing this to the email address you provided but it failed. Thank you for your compliment and interest in my Reports MOD for osTicket. Does it can be deployed into osticket 1.7.2 ? I really love your OS Ticket First Theme and would like to purchase the Customer Client. My question is can I fully customize the CSS file to create a Metro (Windows 8) style. The design needs to be flat colors without gradients. Of course I will also need to update the color palette and replace the logo. Yes, you can feel free to edit the theme as much as you’d like, I just ask that you don’t sell the files as your own. Does it can be deployed into osticket 1.7.0? And prefix in my database is osti_****, therefore do I need to change ost_reports to osti_reports? Yes, it works on 1.7. You can change the prefix if you want to but it should work either way. I am using report 5.0 and when I select report criteria I receive Valid CSRF Token Required. what might be the problem? You ask for a donation but do not give a link to show how we can make the donation. Does the full version come as complete installation or do we still need to copy and paste code into the PHP files? When will this module be available for v1.8.x? Can you send me the latest version please? How can I do the $10 donation for receive the version 6.0. A question. The version 6.0 is compatible with version 1.8? You can use the donate button at the top right of any page on my website. Version 6.0.8 (Current) is compatible with 1.8. Rolled the file back and osTicket works fine (no reporting obviously). Are you sure this report module is compatible with 1.8.x? Didn’t have this issue on 1.7.x at all ..
Did you find a real solution ?! Yes I have it running on the latest build (1.8.0.2). Do you have short tags enabled? If not have you upgraded to use the 6.1 code? I have replaced all of the short tags in 6.1 with the full php tags. This code is looking up something from the config table. Is your config table intact? Also have you tried using the code from 6.1? It seems ok, but somehow it isn’t. To date, I couldn’t resolve this. Any hints are more then welcome. I provided the amount of all future release, please send me files and instruction. Does it works for latest 1.9x? Have you confirmed that this works on 1.9.1? Reports is now working for 1.9.1! Is there anything new or special that needs to be done in order to get Reports working in OSTicket v1.9.1? Or is it rinse-and-repeat for the installation instructions? Is this ready for v1.9.2 yet? Does it works for 1.9.x yet? Does your report tool work with OS Ticket 1.9.3? Does your reports works with OS Ticket 1.9.4 release? Does 6.2 supported reports per organization? 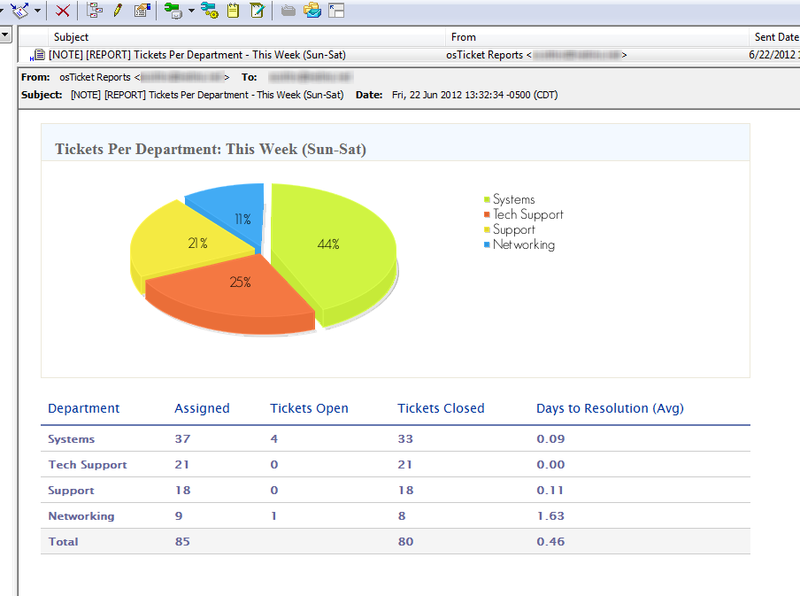 Does your reports works with OS Ticket 1.9.5.1 release? I’ve donate by paypal but i’ve not received anything can you verify? I tried sending it to you but it bounced saying your mailbox was full. Is there somewhere else I can send it or should it be safe to send it again now? Scott, have any news regarding the email? I see a field on your reports, “hours to resolution”. How can you calculate that value, if you dont input “worked hours” to the tickets? If I recall correctly the time was based off of the time between when the ticket was opened and the time the ticket was closed. i need zip file how to get it ? in the donation page i can’t see any login or ID saying that i am (Samuel) paying. How i will receive the zip file if there is no login id for me. Second Q : Will this work in Osticket Version v1.9.8.1 ? Kindly reply i will donate and get the zip file. Second Q Will this work in Osticket Version v1.9.8.1 ? Where to buy the new MOD. You can click on the “Donate” button at the top right of any page on the site. In the comments simply mention what it’s for and I’ll get the appropriate software sent to you. I want to get known that you went the extra mile to give always quick support to something that was revealed not to be your responsibility. Your input and quick assistance forced me to setup another server… then according to your instructions all went smooth and is running great. Great product and support! how much should I pay for the module?? The Module is $35 for the current version or $50 for the current version and all future versions. This module is available in Spanish language?, works with 1.9.12 version? refund your $10 or would you like to send in the rest of a payment? Hello Scott, is the reporting mod still available to buy? The Reports plugin is currently being developed only for the 1.10+ branch, however, 99% of the reports work under 1.9+ (there is a database change regarding ticket threads between 1.9 and 1.10). Also, as an FYI, I tried emailing the address you supplied but it was returned by yahoo saying that account doesn’t exist. -Is it possible to create reports based on custom fields? -Is anyone else having issues with the applications button? -Is anyone else getting the ‘use of unidentified constant…’ messages at the top of the reports page? There currently isn’t support for creating custom field reports, it may be something I look into in the future. The applications button not working is actually an osTicket bug, there is no apps.php page included and so it fails. Can you check on your scp/reports.php line 3? You should have the definition for the REPORTS constant? Having never really delved into PHP before, I am wondering as to the feasibility of creating my own apps page. Has anyone done this? Does anyone believe the “juice is worth the squeeze”, so to speak? What is the possibility of seeing reports by priority at some point in the future? Is it feasible? I want to buy the mod for the reports….i just wanna know if it is compatible with the 1.9.15 version of osticket….and if i have any problem of installing it you’ll help me ? I do have a slightly older version that works with 1.9.15, however, the reporting plugin is no longer being developed so it doesn’t have the latest updates. I wanna buy the older version as you said. How much does it cost and how i should pay you. You can just use the Buy Now button above, I’ll watch for your email address/domain and send you the 1.9.15 version instead of the 1.10. You can send it to my email or to my partner. Hiya, will this plugin allow export of the full ticket/response details? I would like to list every response on a separate row on a spreadsheet, for costing purposes. Not presently, but it’s something we can consider for a future release. Hi Scott! How are you? I bought your plugin last year and it works perfect! I just want need some modifications on a report. I want to show the “Replies per Staff” but i want to see for each person of the staff the tickets he/she has replied. For example :Scott, 3 Tickets resolved and near/above/popup to show these 3 (for example->1.printer issue by X,pc damaged by Y,broken office by Z). Is this possible?If it is not something difficult and i can do it then let me know how,otherwise i would like to hear a price from you for this.